While living in St. Petersburg, Florida I had the pleasure of waking up every day for a couple years just a two-minute walk away from Tampa Bay. Walking my dog and riding my bike along that coastline many days got me fascinated by the tides. Seeing the tide ebb and flow turned my mind to ponder and juggle many statistics about Sea Level rise. I know of no better book about Sea Level Rise than this one. It was published shortly before New York City was deluged by massive Tropical Storm Sandy. John Englander lives on the front lines of Sea Level Rise on the South East Florida coastline. As an oceanographer that front line perspective found him pondering with his pen. His scientific mind and his traveled oceanic perspective led his to speculate in print about how a large hurricane might impact New York City. The first edition of this book was released a week before Sandy inundated New Jersey and New York. The book was incredibly prescient. The book is also very down-to-earth, that is, easy to read and understand. And the oceans and seas are slowly, inexorably inching up and changing shorelines of mother earth. 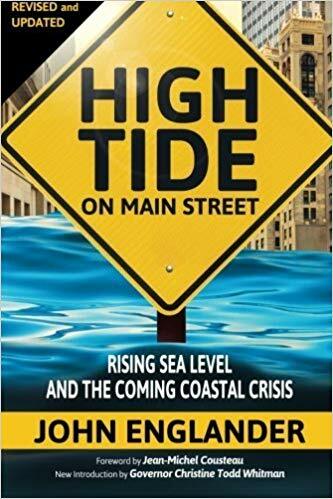 Again, this is the best book to understand just how and why we all will see High Tide on Main Street.